"If there ever comes a day where we can't be together, keep me in your heart. I'll stay there forever." 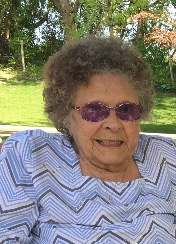 Jayne Marie Walker (Link), 93, of Dubuque, Iowa, passed away on December 17, 2017, surrounded by family. A memorial mass to celebrate Jayne's life will be held Saturday, August 11, 2018 at 10 a.m. at St. Anthony's Catholic Church with Rev. Steven Rosonke officiating. Burial will follow in Center Grove Cemetery. Family and friends may gather after 9:00 a.m. at the church until time of mass. Wherever Jayne "GG" went, she always had on something purple and her favorite purple glasses, so to honor that, the family requests that those who attend the memorial also wear something purple. Leonard Funeral Home & Crematory, 2595 Rockdale Road is assisting the family. A native of Dubuque, Jayne was born on September 16,1924, to John B Link and Elva J Roberts. She graduated from Dubuque Senior High School in 1942 and married her husband, the late Robert (Bob) Edward Walker, on July 13, 1946, thereafter becoming a proud firefighter wife and mother of three., Jayne had an unwaveringly strong faith and for many years walked to daily morning mass through sun, snow or rain. Close to her favorite chair you would always find her daily prayer book, the morning newspaper, and a crossword puzzle book or two. During evenings you would often find her visiting with family and friends- cooking delicious homemade meals, laughing and telling stories, and enjoying a nice chilled glass of Rhine wine. Family came first, and Jayne raised her children to be humble, hardworking, appreciative individuals, traits passed down to future generations, though she did love to spoil her grandchildren and great grandchildren. Whether friend or family, Jayne welcomed all into her home and made sure you were comfortable, well-fed and never thirsty. She is survived by children Robert (Maureen) Walker, John (Donna) Walker, and Sher Rice; grandchildren Amy (Brad) Kraft, Erin (Ben) Gardner, Sierra (Nathanael) Powell, Eric (Laurie) Miller, and Nathan (Laura) Miller; and great grandchildren Hannah and Sarah Kraft, Ella and Walker Gardner, Benjamin Powell, Ayden, Connor and Tierney Miller, and Alyvia, Aubrey and Nathan Miller, Jr.
She is preceded in death by her parents; husband; brother, Jim Link; sister-in-law Marlyn Link; and son-in-law, John Rice. Jayne was always well cared for, and her family would like to extend their sincere thanks to the staff of Hospice of Dubuque and Stonehill Care Center, as well as Dr. Kirkendall and Nurse Kate for their dedication and compassion towards Jayne through recent years and her final days. Affectionately nicknamed "GG" by her grandchildren and great grandchildren, Jayne will be dearly missed, but continually celebrated for her unshaking, genuine love and concern for all of those close to her heart. In lieu of flowers, the family requests a donation be made to Hospice of Dubuque.